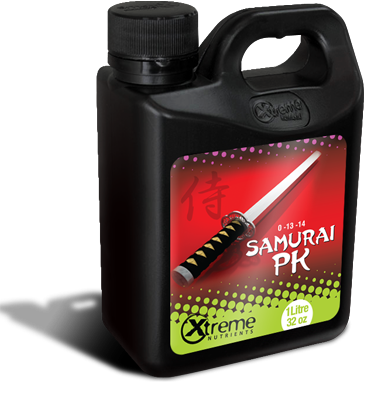 Samurai PK is the ultimate super boost for all fruits and flowers. It consist of a pharmaceutical grade natural mineral phosphate and potassium, made from the purest raw material. Samurai PK stimulates the development of bud and fruit. It functions as one of the major players in the process of photosynthesis, nutrient transport and energy transfer. Smaurai PK should be used in the 3rd week of bloom until harvest at a rate of 2-4 ml/Gallon.